Since 1979 We Work So You Win Choosing the right law firm may be one of the most important decisions you will have to make in your lifetime. Lallo & Feldman have represented clients in more than 24,000 cases since the law firm was founded in 1979. A full service general law practice, Lallo & Feldman is well known for extensive experience in civil and criminal litigation. Lallo & Feldman provides representation for individuals in personal injury and wrongful death actions stemming from automobile accidents, defective products, medical malpractice, and other acts of negligence. The firm specializes in representing workers injured on the job. It also handles a wide variety of criminal defense matters ranging from misdemeanors to serious felony charges in municipal, state and federal courts. In the state of Ohio, any employee who is injured on the job or suffers from an occupational disease or repetitive motion condition may file a claim. This is applicable whether it is the fault of the employee, the employer, or a third party. It does not matter whether the injured party has missed any time from work or has not been on the job for days, weeks, months, or indefinitely. The BWC and employers may tell you, you don't need an attorney, however they have one and so should you. Statistics prove that claimants have a better chance of winning their claim if a lawyer is hired. A fireman, close to retirement, injured his back and knee on the job. At first his claim was denied by the BWC because he had pre-existing degenerative conditions. Lallo & Feldman fought that ruling and won a new decision that allowed his claim for aggravation of pre-existing conditions. Today the fireman is retired, receiving Permanent Total Disability, and has financial security. A personal injury occurs whenever a person has been injured as a result of an act of negligence or breach of duty owed by another, i.e. an automobile accident, a defective or faulty product, malpractice of a doctor or other professional, property owner's failure to properly maintain his or her premises, and other negligent matters. Lallo & Feldman takes the necessary steps to make sure clients are represented accordingly by evaluating the strengths and weaknesses of a case and fighting for maximum compensation. Lallo & Feldman interviews witnesses, obtains reports and medical documentation, takes photographs, utilizes investigators, and employs experts where necessary. Lallo & Feldman also negotiates effectively with insurance companies for payment of medical bills, lost wages, pain and suffering, and other damages. They will advise when a settlement is fair, or when it is in the clients best interest to use the Court system to further obtain the money damages deserved. A woman, hit by a drunk driver with no insurance, suffered a permanent brain injury. Unfortunately, as a result of her injury, her personality is different and she will never be able to work again. Lallo & Feldman settled the case for the maximum available policy limit under the client's uninsured motorists coverage. However, the health insurance carrier demanded subrogation and reimbursement of medical bills paid out, which amounted to over one half the woman's recovery. Lallo & Feldman continued to fight for the client, filing a lawsuit against the health insurance carrier. This suit was eventually settled and the client was able to keep a substantial portion of her settlement. Put the power of the law on your side. 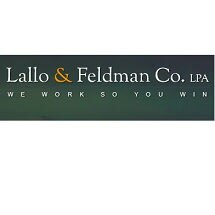 Lallo & Feldman Co., L.P.A. is located in Willoughby and Cleveland, Ohio, and serves clients in Greater Cleveland and throughout Northeast Ohio, including Mentor, Painesville, Eastlake, Shaker Heights, Mayfield, Lyndhurst, Chardon, Ashtabula, Jefferson, Beachwood, Lorain, Warren, Youngstown, Cuyahoga County, Lake County, Ashtabula County, Summit County, Trumbull County, Mahoning County and Lorain County.